The little two-stroke Yamaha RX135 is a mainstay of India and South East Asia. It’s often the bike you’ll see buzzing away underneath a mountain of groceries, kids and terrified-looking livestock as it picks its way through traffic. It’s simple, reliable and isn’t the kind of bike that gets much attention – beyond the occasional replacement of a blown shock or collapsed fork. 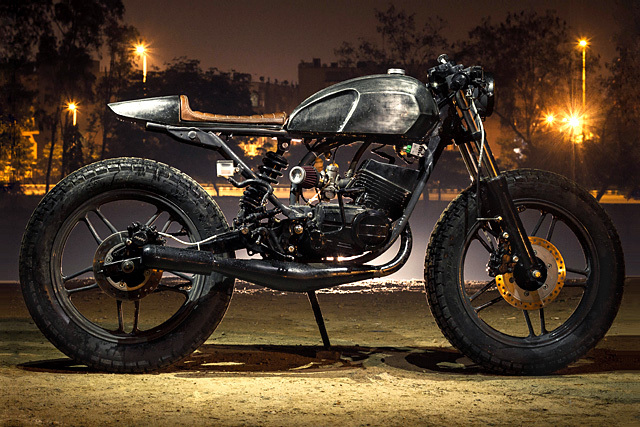 But this time the brave little Yamaha has been sculptured into a gorgeous backstreet café racer by Bull City Customs – a New Delhi based workshop that specializes in good looking custom bikes that are also fun and practical to ride.